Glucosamine 1500 Comlpex is a high potency superior Glucosamine formula, that supports healthy joint cartilage reducing pain from, swollen and stiff joints. The high potency formula is further boosted with Bromelain , Vitamin C and Manganese are natural anti-inflammatory joint treatment agents. Glucosamine is a building block of healthy joints that support and nourish connective tissues and cartilage. It alsoreliefs joint stiffness and prevents degeneration of effected knee joints. 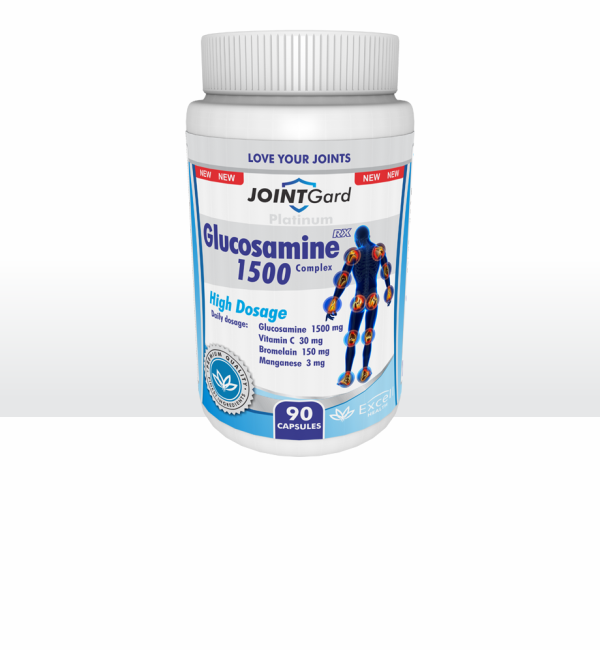 Glucosamine is a compound naturally found within the cartilage of joints. It acts as one of the body's natural shock-absorbents and joint lubricants, allowing us to move around without or with less joint, bone and muscle pains. Glucosamine possesses natural anti-inflammatory and anti-aging properties and is a highly effective treatment for people with bone and joint pain, glucosamine aids in treating common symptoms of age-related disorders like arthritis and osteoarthritis. It can also help improve digestion and gut health, mobility, range of motion and general joint health. Bromelain is a natural anti-inflammatory agent that brings temporary relief from inflammation caused by arthritis, surgery, injury, disease, or muscle soreness. Bromelain may also reduce the numbness, tingling, aching, and loss of motor and sensory function in the fingers resulting from Carpal Tunnel Syndrome (CTS). A painfull condition of the hands often suffered by cyclists. Bromelain speeds up the body's healing process after surgery and is a naturalpain killer. Vitamin C aids with collagen production, Manganese is a powerful anti-oxidant and completes this highly effective joint formula. Manganese increases the effectiveness of vitamin E and B vitamins, manganese also increases the effectiveness of glucosamine, which have been helpful to people suffering from arthritis. Glucosamine might cause allergic reactions in people who are allergic to shellfish and Iodine. If you are allergic to pineapple, latex, wheat, celery, papain, carrot, fennel, cypress pollen, or grass pollen, you might have an allergic reaction to Bromelain. Bromelain may cause some side effects, such as diarrhea and stomach and intestinal discomfort. Bromelain may also cause allergic reactions, especially in people who have other allergies. If you have allergies, be sure to check with your healthcare provider before taking bromelain.